Not long after she walked the runway for Balenciaga, Gisele Bündchen was spotted out for a shop and stroll with her son Benjamin. While accompanied by some friends, the Brazilian model hit a few stores as 10-month-old Benjamin sat quietly in his stroller chewing on a teether. 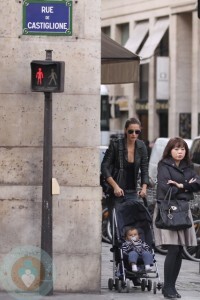 Gisele pushes a Maclaren Triumph stroller.